Having run two Collies and a GSD in agility, Katie Gurney decided that she wanted to run a smaller dog so she began to look at breeds such as Working Cockers, Poodles and various crosses. She decided that none of these were quite right for her so she kept looking - and then she discovered the Boston Terrier! George (Gorgeous George to his friends) my 4 .5 year old Boston Terrier. If anyone has come across a Boston, they'll know they are cheeky little monkeys and have bags of personality. 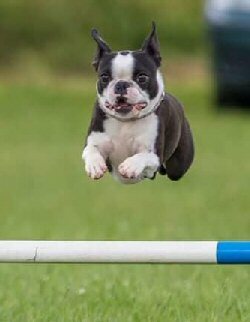 I was told by a number of people that they'd never seen a Boston Terrier in agility and besides, they probably weren't the best for it because of their short noses! Thankfully George has a good nose for a Boston and doesn't have any breathing problems. I'm very careful in the heat as to how much I run him but I'm the same with my Border Collie. George isn't my first Boston. Unfortunately I lost Banjo, my first Boston, at just three years old. I was heartbroken but having discovered that Banjo loved agility, I decided to go back to the same breeder and that's when I got George. I just hoped when he was old enough that he liked agility as much as Banjo had. In fact, he liked it more. He certainly has his moments. In his first couple of years training, he was a bit like a kangaroo and spent more time in the air bouncing up at me than one the ground and, as you are timed, this isn't good. With lots of extra training for both my self and him, he is now going great. He has the same attitude as my first Collie. He's driven, looking for what's next and wants to please. He gives it his all when asked and just loves being out on a course whether it's an Agility or Jumping round. I get lovely comments about him when we come out of the ring. He's had several wins and is the first dog of mine to win out of Grade 3. He also won our club trophy at the Christmas dinner for the dog with the most clear rounds of the year. I'm super proud of him and enjoy running him whether it's training or at a show. Boston's are really easy to train as they love to please and are just great fun to own. It's really nice seeing other breeds in agility as the majority of dogs in agility are either Collies or Collie Xs even in Medium and Small heights. I've never come across another Boston at a show yet but I hope I do. Katie Gurney (40+) started Agility with her first dog a GSD called Tylah 13 years ago. Although she'd only ever had a handful of clear rounds that never stopped her. She was hooked. 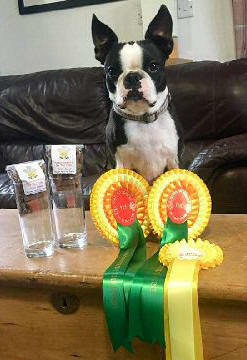 She has also run two Collies and now her Boston Terrier which is totally different from running Large dogs. 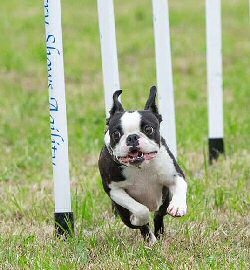 She absolutely loves agility and can't imagine a life without it.